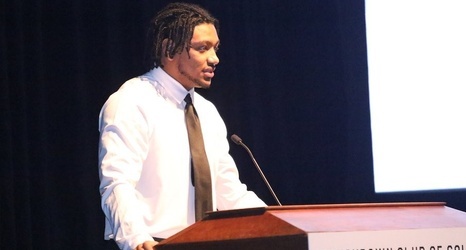 Five current Ohio State players and several potential future Buckeyes were among those honored at Saturday night's Touchdown Club of Columbus banquet. Ohio State running back J.K. Dobbins, wide receiver K.J. Hill, linebacker Malik Harrison and cornerbacks Damon Arnette and Jeffrey Okudah were all on hand for Saturday night's banquet at Express Live in downtown Columbus, where they were recognized by the Touchdown Club of Columbus as "Players to Watch" for the 2019 season. Former Ohio State quarterback Dwayne Haskins was also the recipient of three awards from the Touchdown Club of Columbus this year – the Chic Harley Award (college football player of the year), Sammy Baugh Award (top college passer) and Kellen Moore Award (top quarterback) – but he was not in attendance for Saturday night's banquet as he trains for the NFL Scouting Combine.